Timed photo, Taken on 10/7/06, aroximately 5pm in the afternoon. I hiked in to the forest and out into the middle of this river. I had already fallen into the river, but was determined to take this shot. Freezing from being wet, I aligned myself up with a bend in this river where the sun would drop and lighten these trees in front for about 5 minutes. The whole thing was quite an experience and was very beautiful. 2) Selective color to bring the colors in the water out a bit better. Love the reds and yellows in this one. It feels a bit tilted but I am not sure. Maybe a bit dark at the bottom right but it is still very nice. The colors in this one are perfect. I love the smoothness of the water and the composition. I may have played around more with the crop to take more off of the top and bottom. Looks like I spot I'd love to just spend some time at. Incredible shot. 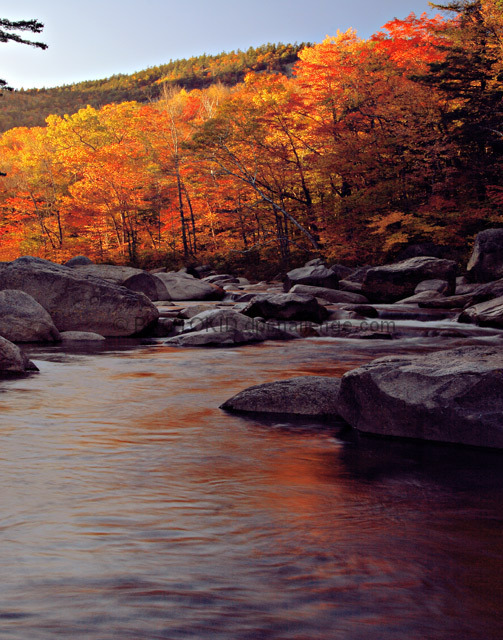 I love the water and how it reflected the fall colors. Lovely! Nice clear, simple lines with great colorful foliage topping it. I like the movement throughout the whole photo. I gave this a 6 in the challenge, which is actually a good score from me for a landscape. I rarely like landscapes. I like the shapes of the rocks, I like the rich reds, especially in reflection. The bend of the river is nice, but you must realize that I've seen a million pictures of bends of rivers. If you look on the lower right, there's a crosshatching effect. I love that. I'd like to see more interesting textures like that. You've got a couple branches sticking in from the left: not enough to establish a foreground but enough to be distracting. Beautiful colors! If only the sky weren't overcast. How come nature never cooperates? Good job on the composition, I like the ratio of water to trees to sky. I like the orange glow of the trees. The water seems a little dull and flat, but the reflected orange is very nice. Some suggestions: Try cropping the top section of the image down to where the sky starts. (You can do this in the browser window using the scroll bar to see what I mean). Eliminating the sky removes the distraction of the branches on the left and puts the emphasis on the trees. It also removes the competing blue of the sky and makes the predominant colors the contrasting blue-gray of the water/rock with the orange of the trees and reflection. A slight curves adjustment on the highlights of the river (the lighter gray) may help add a little mor pop to the lower half of the image. beautiful autumn scene! Good timing and exposure, i probably would have cropped out that branch in the left sky, but lovely work! Lovely colours, I like the contrast between the bright trees and the dark water. You could have cloned out the evergreen branches on the left side. good contrast in the light and colourfull trees and the dark coldness of the rocks in the foreground. beautiful autumn colours though, it really feels like some of the trees are on fire. my one gripe is that the stray branches in the right hand side take away from it a little. would have like to have seen them clones out. Nicely composed. I might crop out that hint of the tree on the left, but the colors and overall set up is great. Proudly hosted by Sargasso Networks. Current Server Time: 04/21/2019 12:06:45 PM EDT.